The is file includes numbers 41-60. 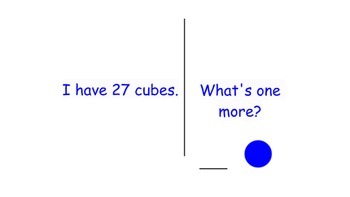 On the left side of the page, the student will read how many cubes "I" have. The student will click the blue circle and reveal the answer. Check out my bundle pack that includes numbers from 1 all the way to 110! The first two sets (number 1-22) include cubes with counting practice embedded in the station as well.